After visiting Erasmo and having lunch in Treporti, we are on the vaporetto to Burano along with a lot of other people. They all get out and we join the throng. I didn’t remember it being this crowded seven years ago. 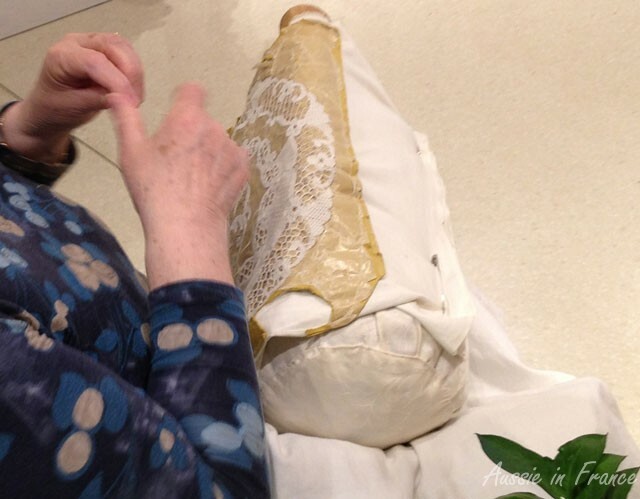 We enter what looks like a very expensive lace and household linen shop and see a lady making lace by hand. 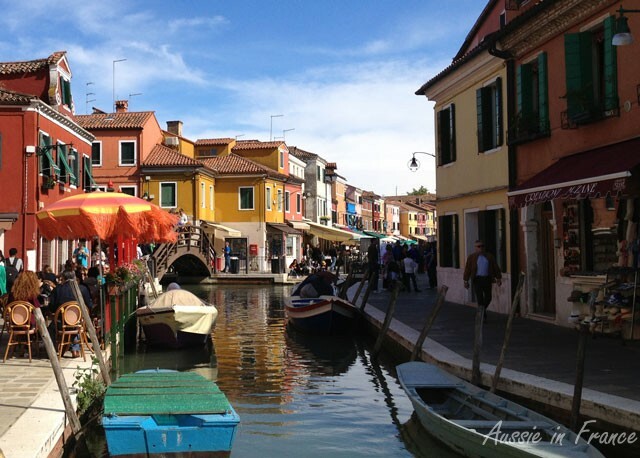 Burano claims to have the oldest tradition in Europe for embroidered/needle lace which was created in about 1500 using a needle and thread. When we come out, we take the first turn to the right and find ourselves surprisingly alone. 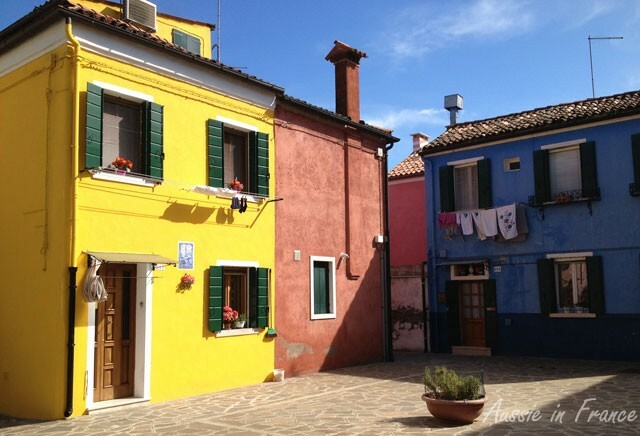 This is the Burano I remember from seven years ago, with its gaily coloured houses and quiet streets. 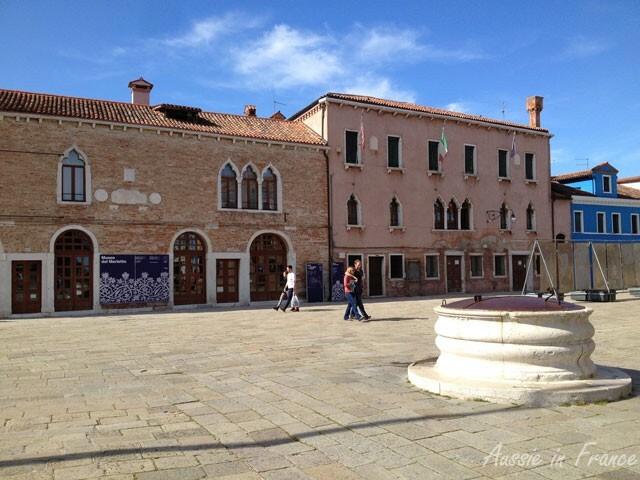 We wander around the back streets for a while then down to the lagoon and back through the canal until we rejoin the main square Piazza Galuppi. 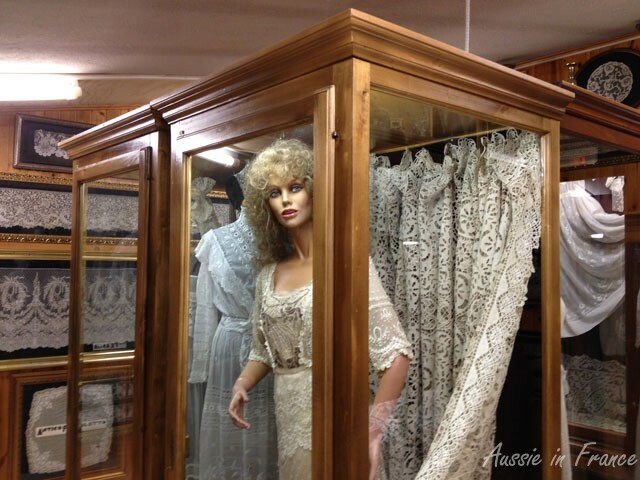 I want to visit a shop we went to last time that has a lace museum inside but we can’t seem to find it. On the right there is a sign for the Venetian Museo del Merlotto housed in the historic palace of Torcello which houses the Burano Lace School from 1872 to 1970, but it’s not what we’re looking for. All I can remember from last time is that it was about midday and was very hot! 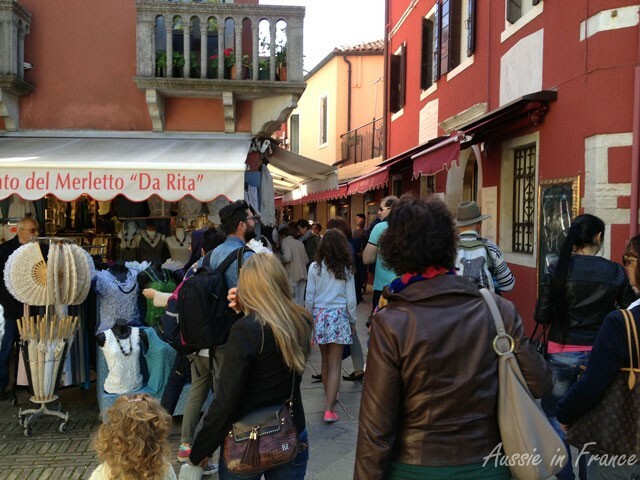 I decide to ask so we go into a shop called Dalla Lidia Merletti and I explain what I’m looking for. Yes, the museum is down the back of the shop! Cabinets containing lace line the long corridor and at the end is a room full of more lace ncluding lace dresses. At the top of a wooden staircase is another part of the collection, including French lace. In the 1600s Burano embroidery became increasingly complicated and it soon spread through the rest of Europe. France imported Burano lacemakers to work in the lacemaking areas of France, particularly Normandy. We see an example of French lace. Back in the shop, we are asked in French if we want to buy anything. 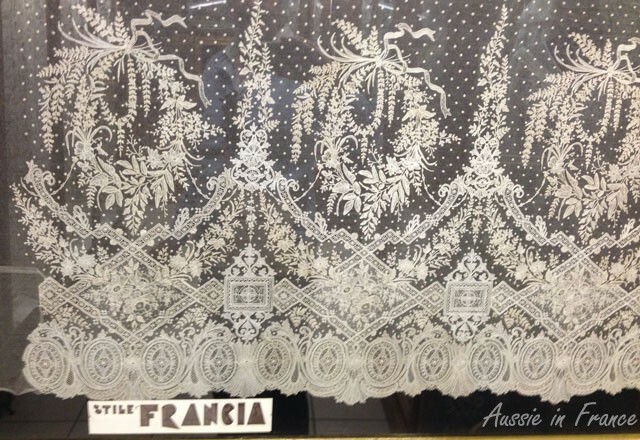 I would like to find a piece of local lace to make a fabric panel to use as a bedhead in Blois. A table runner would seem to be a good solution. We finally settle on a very expensive piece but Jean Michel easily manages to bring the price down by one-third! The shop is not very busy and we are soon talking about home exchanges with the entire staff. We walk out very pleased with ourselves and make our way back towards the ferry. A crowd has gathered around a band of gondoliers with accordeons and other instruments, all singing very loudly, particularly one man in ordinary clothes wearing a gondolier’s hat. At the end, the gondoliers all applaud and he walks off into the crowd. He was just a passer-by! An ice-cream seems a fitting way to end the day while waiting for the vaporetto to go back to Venice. 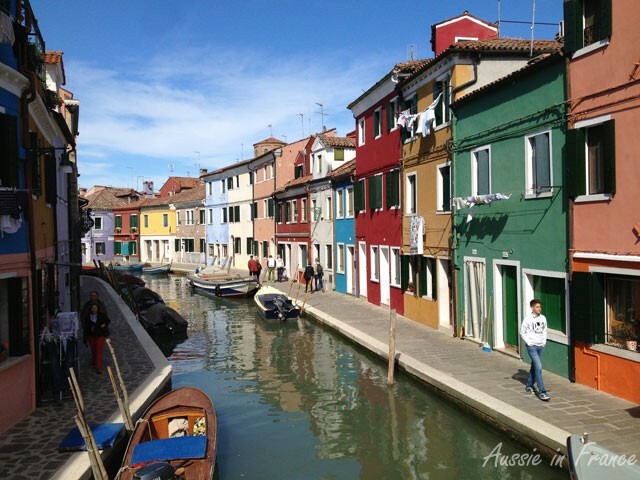 This entry was posted in Italy, Sightseeing and tagged Burano lace museum, lace making, lace making in Burano, off the beaten track in Venise, secret venise. Bookmark the permalink. Ooooo, now I’ve got lace envy. I love needlelace and Venetian is the very best. I look forward to seeing the piece you bought at some stage. No. Simon has, but I haven’t. I would have put up a photo but I left it in Blois! The rich variety of colours in the houses and buildings really catches my eye. Lovely shots!